The MKG proposed higher fare VIP Metro Bus would give generous individuals the opportunity to spread their wealth, ride in comfort, and fund the NFTA so that they don't have to raise the bus rates for all of the other bus riders. There is nothing in the papers this morning about how the election is going which makes me wonder what is going on that they do not want us to know about. That is how you have to read the papers these days. Notice how there is nothing about the war in Iraq in the news anymore? That war must be going well! Now I think John McCain is gaining in the polls because today we heard nothing about the polls, nothing at all. It is like being in Communist Russia and reading Pravda. You have to learn how to interpret things. I know what I'm talking about, by the way, about Pravda. My Uncle Bob knew Russian and used to read it all the time. Leonard Pennario told me Russians used to be sneaky in the Van Cliburn Competition. He was on the jury there so he knew. OK, enough about Russia. Let's focus on important news. How about the rate hikes they are proposing for the Metro Buses? Howard and I think that there is a better way for the bus people to make money and that is to have VIP buses. Every fourth bus, let's say, could be stipulated a VIP bus. The fare would be, oh, $4. Perhaps it could be twice as much as the normal fare. Rules would be different on VIP buses. No electronic devices would be allowed. You would not have to listen to slugs' loud headphones going "Ch-ch-ch-ch-ch." Cell phones would also be verboten. As would pants around someone's ankles. And hoodies. And other attire designed to project a aggressive, frightening image. People under 21 would not be permitted on a VIP bus. No screaming kids! Howard's cousin Ron Moss would not be allowed either. You would not have Moss getting on the bus shouting "Byron Brown!" and other things he likes to yell. We think people would shell out to ride in this increased comfort. That way the bus would become a more viable transportation option for people who might ride it except for that means they have to sit cheek by jowl with shoving screaming students and Ron Moss and people who dress like gangsters. Wow, look at that sentence! When I am writing my book on Leonard Pennario I do not write sentences like that. Also there would be no talking on the VIP bus. Isn't that the worst, when you get on the bus after a long day at work and someone wants to talk to you? But perhaps we would not need that rule because on the VIP bus you would be with like-minded people. 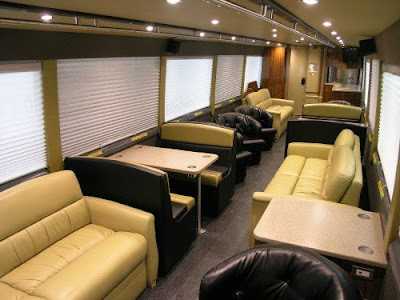 Mayhap at some point the Niagara Frontier Transportation Authority (NFTA) could explore the possibility of serving coffee or cocktails on the VIP bus, depending on the time of day and the inclination of the passengers. Speaking of which, I have a spooky story about listening up that now it is time to share, seeing that every day in October we touch upon the supernatural. One day when I was about 25 I made the dumb decision to go to Inspiration Stump at Lily Dale. This was my first trip to Lily Dale. I think I went there a total of three times. I got into the blues when I was in my 20s because of my friendship with Shakin' Smith, the great Buffalo blues harmonica virtuoso. That is all a long story but anyway, when I went to Lily Dale that time, that was what my mind is on. Blues! And my favorite blues musician at the time was the guitarist Elmore James. I still have a soft spot for Elmore. And apparently Elmore, though he had a heart attack in his 40s and died before I was born, has a soft spot for me. Because at Inspiration Stump, something funny happened. I should explain for out-of-towners what Inspiration Stump is. It is a clearing in the forest near the spiritualist community of Lily Dale where there are benches and an old tree stump. You sit there and a witch shows up and gives you messages from the Great Beyond. Buffalonians are a breed apart. Do not even ask. So there I was, at Inspiration Stump, sitting on a bench with my friend Jacquetta. And this medium shows up and she starts handing out messages and suddenly she looks in our direction. "Elmore," she says. "Does anyone know an Elmore?" I couldn't speak. I was that shocked. The truth was, I had been listening to nothing but Elmore James for about a week, solid. He was in my head right at that moment, singing "Sunnyland." "Seems like I heard... that lonesome Sunnyland blow!" What in the world? He could not be calling me, could he? This medium locked eyes with me and asked if I knew someone named Elmore. My heart was pounding. I shook my head no. Finally, reluctantly, she turned her attention to someone else. Now I wonder if I should have said something. My friend Jacquetta has never let me hear the end of that. She still jokes about Elmore James yelling at me: "Next time I call you, woman, pick up the phone!" As for the election, electoral-vote.com has Obama winning 375 electoral votes, while fivethirtyeight.com has it at 354. So maybe someone thinks this one is all but over. Perhaps they consulted someone at Lily Dale. A small correction: The mediums who serve Spirit by bringing messages to those in attendance at Inspiration Stump are not witches. Our religion is Spiritualism, not wicca.